Giving it is what’s difficult. In the end you don’t get it. Getting God’s mercy is easy—just ask Thomas the Apostle. Jesus forgave him for his sin of disbelief the moment he repented and said those famous words, “My Lord and my God!” Thomas didn’t have to beg Jesus, or bargain with Jesus, or grovel in the dirt before our Lord agreed to show him mercy. All Thomas needed to do was to express his repentance in some way, and forgiveness was his. This is the core message of Divine Mercy Sunday: that every sin can be forgiven; that every sinner can be saved; that God’s mercy (as today’s responsorial psalm reminds us) “endures forever”. 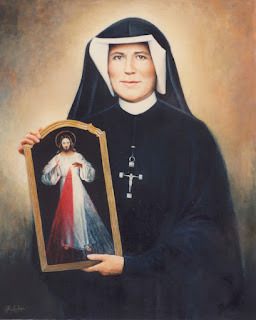 This is also the message St. Faustina gave to the world through her diary. There she wrote about the private revelations she received from Jesus about God’s mercy during a seven year period, beginning in 1931. One of those revelations included a vision of Jesus with two rays of light coming out of his heart. Jesus asked her to have a painting done replicating the vision, and to have it signed with the words, “Jesus, I trust in you.” We, of course, have a copy of that painting here in our church where the tabernacle used to be. Notice, out of all the petitions in the Our Father—“Thy kingdom come”; “Thy will be done”; “Give us this day our daily bread”; etc.—Jesus went back to and reiterated just one. That must mean it’s EXTREMELY IMPORTANT!!! Of course, it’s also important for us to remember in this context that practicing forgiveness and mercy does not mean that we should totally ignore or dispense with justice. In fact, sometimes dispensing with justice is the most unmerciful thing you can do for a person—and for the people in that person’s life. I came across a great example of this just the other day on the web site of the Washington Post. There was an article there about a 20-year-old man from Texas named Eric Couch. Maybe some of you know the story. On June 13, 2013, when he was 16-years-of-age, Eric Couch killed 4 people just outside of Ft. Worth, Texas, when he plowed his father’s Ford F-350 pickup truck into a group of men and women on the side of the road who were trying to help a stranded motorist. He seriously injured some others who were there, one of whom is now paralyzed and can communicate only by blinking. Oh, and did I mention that Couch was drunk at the time? His lawyers claimed he was suffering from something they call “affluenza”—supposedly a condition which made him incapable of telling right from wrong because of his parents’ wealth. The judge’s sentence? Probation—a probation which Couch violated two years later by drinking and then fleeing the country with his mother! The two fled after a video appeared online of Couch consuming alcohol. He was eventually caught, taken back to the United States and sentenced—to just two years in prison (or, as the Washington Post article put it, 180 days “for each of the four people he killed” in 2013). He was released a couple of days ago. Only two years in prison for consuming alcohol as a minor, killing 4 people while driving recklessly and intoxicated, violating parole, fleeing the country illegally and causing an international incident. That would have been the most merciful thing they could have done for this troubled young man—and for the people in his life. There’s a beautiful prayer that was written by St. Faustina that has this line in it: “Help me, O Lord, that my ears may be merciful, so that I give heed to my neighbors’ needs and not be indifferent to their pains and moanings.” Sometimes our neighbors need our mercy in the form of compassion, patience and understanding, but there are other times when our neighbors need our mercy in the form of “tough love.” Eric Couch has needed the latter since 2013. I hope and pray that someday he finally receives it—for his own sake, and for the sake of everyone else who shares the highway with him in the future. "Psychology and the Good Life" in session. Do you know what the most popular class is at Yale University this semester? Actually, it’s not only the most popular class there this semester, it’s also the most popular class in the school’s 316-year history. One thousand, one hundred and eighty-two students (roughly a quarter of the school’s population) are enrolled. It’s held every Tuesday and Thursday at the university’s concert hall. 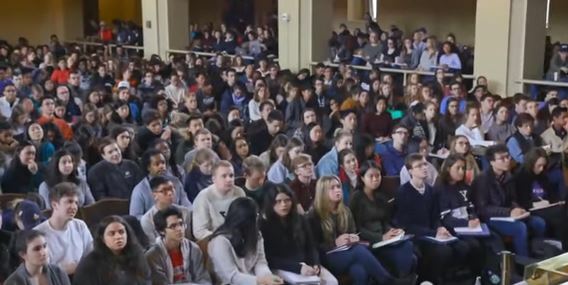 It’s held there because that’s the only place on the Yale campus that’s big enough to accommodate such a large group. So, what is this course that so many have signed up for, in spite of the fact that for most of them (if not all of them) the course is just an elective, and not a requirement? By the way, I should mention at this point that positive psychology or so-called “Happiness 101” courses like this one can also be found at other colleges and universities today. It’s not a phenomenon that’s unique to Yale. Now, please don’t misunderstand me here. I don’t think these courses, per se, are bad. Hopefully, they do a lot of good. But what I want to know is: what is going on—or not going on—in the emotional and spiritual lives of these young people that causes them to have such difficulties dealing with the normal circumstances of daily living? Aren’t these supposed to be some of the smartest young men and women in America right now? Perhaps the students at Yale would do well to go back and explore their roots—and here I mean their academic roots. Many people these days are into that kind of thing, are they not? A lot of people in our country right now are having their DNA analyzed so they can discover their ethnic and national roots. And many of them are surprised at what they find when they get the results (or so they tell us on the television commercials!). Well, here I’m suggesting that these students at Yale rediscover their educational roots. If they do, I think some of them, at least, will be equally surprised by what they discover. Do you know what the original purpose of Yale University was? Do you know why it was founded back in 1701? I don’t think most people do. Yale, like other Ivy League schools, was originally founded to train Protestant ministers! In the case of Yale, it was to train ministers of the Congregational Protestant Church for ministry. Now, what if it were possible to bring back some of the original graduates of Yale—to bring them into the world of 2018 as they were on the day of their graduation in the early 18th century—and allow them to speak to the Yale students of today? If we could do that, if it were possible to do such a thing, what do you think those original graduates would say? You mean, you don’t know? You young men and women don’t already know? You don’t already know the meaning of life? You don’t know where to look to find happiness and peace and strength during your time on this earth? We knew those things three centuries ago! We knew that we were created in God’s image, and that the Lord loved us with an eternal love. That fact alone gave us great joy and happiness! We knew that the meaning of life was to live in a personal relationship with Almighty God, and to follow his plan for our lives. We knew that there would be obstacles and difficulties and problems that we would face along the way, but we also knew that we could rely on the Lord to help us deal with those things. We knew the words of St. Paul from Scripture—“I can do all things in Christ who strengthens me”—and we knew that we should apply those words to our own lives.We knew all these things because we believed that Jesus Christ was risen, and alive, and with us! We believed in the very depths of our hearts that Jesus had conquered sin, Satan and eternal death by his resurrection on Easter Sunday, and that he would share that risen life with us even here on this earth—although we knew we couldn’t experience the fullness of it until we got to heaven after we died.We knew all these things because we were taught them in our families, and in the churches we worshipped at every Sunday—and from our studies at Yale.What, exactly, are they teaching you in the 21st century at our alma mater? Oh, if they only knew! Actually, they probably do know. I believe that those who are living with the Lord in eternity know a lot about what’s going on down here on earth. The great St. Augustine once said, “Oh Lord, you made us for yourself, and our hearts are restless until they rest in you.” He said that after his conversion—after his conversion from a hedonistic lifestyle that would have made Hugh Hefner proud. Augustine had a restless heart. So do those students at Yale. And so do you and I. The restlessness never goes away completely in this life; it will only end completely when we see the Lord face to face in his kingdom. But much of it can be taken away here if we understand the meaning of life and act on that understanding. In other words, if we understand the importance of developing a personal relationship with God and of seeking to do his will every day. The very first graduates of Yale University knew that. It’s why they were training to be ministers. I hope the teachers of these “Happiness 101” courses make it clear to their students that if they want to find a measure of happiness on earth in the midst of all the stress and all the suffering, they will need to develop a strong spiritual life. Psychological insights, as important as they might be, are no substitute for a personal relationship with the Lord of the universe! 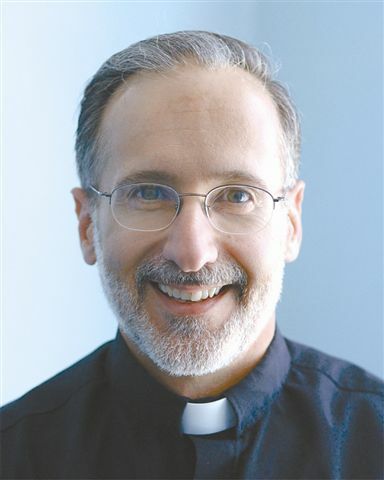 For a Catholic, they can never be a substitute for a personal relationship with the risen Christ: a relationship that’s nourished by prayer and the sacraments. I hope and pray that you, personally, believe that—because it’s the truth. If you do believe it, of course, then I (or some other priest) will obviously see you at Mass next weekend—and every weekend thereafter.